Advanced Schenkerian Analysis: Perspectives on Phrase Rhythm, Motive, and Form is a textbook for students with some background in Schenkerian theory. It begins with an overview of Schenker's theories, then progresses systematically from the phrase and their various combinations to longer and more complex works. 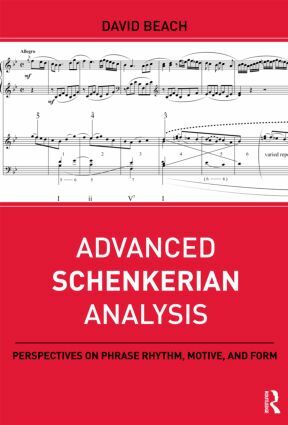 Unlike other texts on this subject, Advanced Schenkerian Analysis combines the study of multi-level pitch organization with that of phrase rhythm (the interaction of phrase and hypermeter), motivic repetition at different structural levels, and form. It also contains analytic graphs of several extended movements, separate works, and songs. A separate Instructor’s Manual provides additional advice and solutions (graphs) of all recommended assignments.